Home » CherryShock » Pictures » Little Help? OMG Ahahahahahaha!!!!! Poor Sora ^^ 'spose someone had better save him... He bugged me not long ago so it won't be me!! LMFAO!!!!! 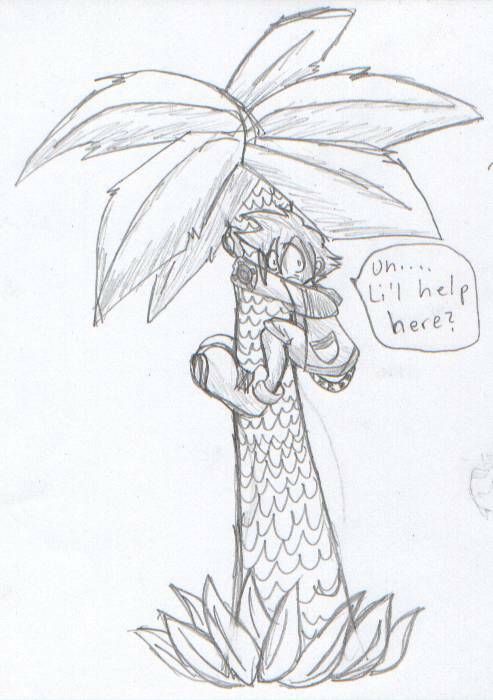 Sora's stuck in a palm tree again!!!! I was wondering that myself...With feet like those, it's a wonder her can swim, run, jump. and especially climb slippery trees... XD I'LL SAVE U, SORA! *jumps up in tree* Oh Sorry, forgot I was afraid of hieghts..
HAHAHA! sora in distress? ILL SAVE YOU MY LOVE! here i come!